For over 30 years, I've been waiting for my life to slow down. Through teaching and college and marriage and babies and missions and raising a houseful of youngsters and pastor's wifing and taking care of my parents from afar, I've expected life to slow down right after this current crisis, and then I'll get to do all the stuff I've set aside for the time being. Just this morning, I thought of of a few things I would like to do, if I had the time. Call my niece Annette and just chat. Practice drawing, just for fun, and to improve my skills. Teach young girls in my life how to sew. Go to garage sales with my daughters. Write short stories, just for practice. Redo the bathroom walls and floor. Meanwhile, reality: It just never stops. Around every corner, some other craziness pops up. But I keep hoping. Other people seem to have found the magic key to an empty nest, a controllable schedule, and manageable demands on their time. This is finals week for my many college kids. Emily graduates tomorrow. Her open house is Sunday. My dad is coming once again for the summer, arriving this evening and escorted by my brother Fred. Jenny just repainted Amy's old room and moved into it. Amy is home from Thailand for a visit. Her friend Joy came with her and was here for two weeks before going on to visit an aunt in New York. So there has been great shuffling of belongings, and sorting out of excess, and sightseeing with visitors, and brain-wracking about who should sleep where, and getting ready of bedrooms, and dragging of furniture, and making of food, and phone calls, and texts. I often feel like the hub of a rapidly-turning wheel. Paul wasn't very excited about giving up our newly-remodeled bedroom again for Dad. One summer we had him in our pop-up camper, which Dad wouldn't mind, but I don't have the heart to put a 100-year-old in the camper. So Paul moved the camper home and Fred will sleep there for the weekend, then it'll become my sewing area if I have any time to sew. Dad will be in the sewing room. Amy will be in Jenny's old room. Jenny is in Amy's old room. At the end of the day on Wednesday, I jotted down everything I could remember that had happened that day. Finals week, just for context. Today Amy and her Thai friend Joy got up at 3 a.m. to go to the airport. Amy saw Joy off and went shopping at the Goodwill bins when they opened, calling me with questions about what I wanted. Ben left for OSU with bags and a grocery list for me, but his car got hot at Horse Creek Farms. Paul came crashing in the back door asking for milk jugs, I found two in the recycle, and he filled them with water, took them to Ben, took the car to Petra--the repair place in Harrisburg--and brought Ben home. Ben worked on schoolwork at home. Thankfully he didn’t have any finals he had to be at OSU for. Jenny went to Linn-Benton for her last final, and got a Red Bull to celebrate. I madly sewed Emily’s graduation dress. The princess seams in front would not cooperate. I sewed and tore and fitted and pinned and sewed and tore some more. Ben was afraid his car would need a new head gasket in addition to a new radiator. It was worth the latter but not the former. Emily had tea with her friend Esta and messaged me for the story of Matt saving Amy’s life when Sty the mean neighbor boy tried to push her in the water hole. I called Emily, she put the phone on speaker, and I told the story in between pinning and sewing. I also tried to get ready for Dad and Fred’s arrival on Friday and graduation on Saturday and the open house on Sunday. I tested the gouda cheese dip recipe. Definitely WITH smoke flavoring and not without. Emily came home and finished her last final, online I believe. We needed a twin-size bed for Dad which will become Jenny’s after he leaves, so I scoured Craigslist ads and texted and emailed. Steven needed someone to take him to Lebanon where his car was being worked on. Emily said she could. Right after Amy came home from Portland, Paul and I hustled off to Goodwill to see if they had their nice refurbished mattresses. They didn’t. We got Steven at the fire station and brought him here, and Emily took him to Lebanon. Joy called Amy and said her flight was delayed and she missed her connection. Very scary on her first flight alone. Amy tried to help her over the phone. Ben needed a ride to Petra to get his car. I don’t recall who took him. The car did NOT have a blown head gasket. Relief for all. I madly sewed and arranged to see a couple of Craigslist beds. Ben, Amy, and Jenny went to St. Vinnie’s, just for fun. I told everyone to fix their own leftovers for supper. After the kids came home, Paul and Jenny went and got Keith’s pickup then went to look at beds. Jenny is picky about smells, so I said she needs to go along, and not me. They got a nice twin bed from a little old lady, for $80. I stayed home and sewed. Joy finally made it to Syracuse. Paul rearranged the remaining furniture in my sewing room so I could get it ready for Dad. At the end of the day, I'm not sure I'd change anything, because there's no person I'd choose to not have in my life. We note that I have time to write a blog post now and then. Writing things out is like eating a good breakfast: a necessity to keeping a clear head in the chaos. Maybe after graduation things will slow down. Ben plans to move out soon, after "his" room is vacated in a house with a few other students, in Corvallis. And Emily might move out also, depending on which job offer she accepts and how much it pays. So I may or may not have time to quilt and draw. 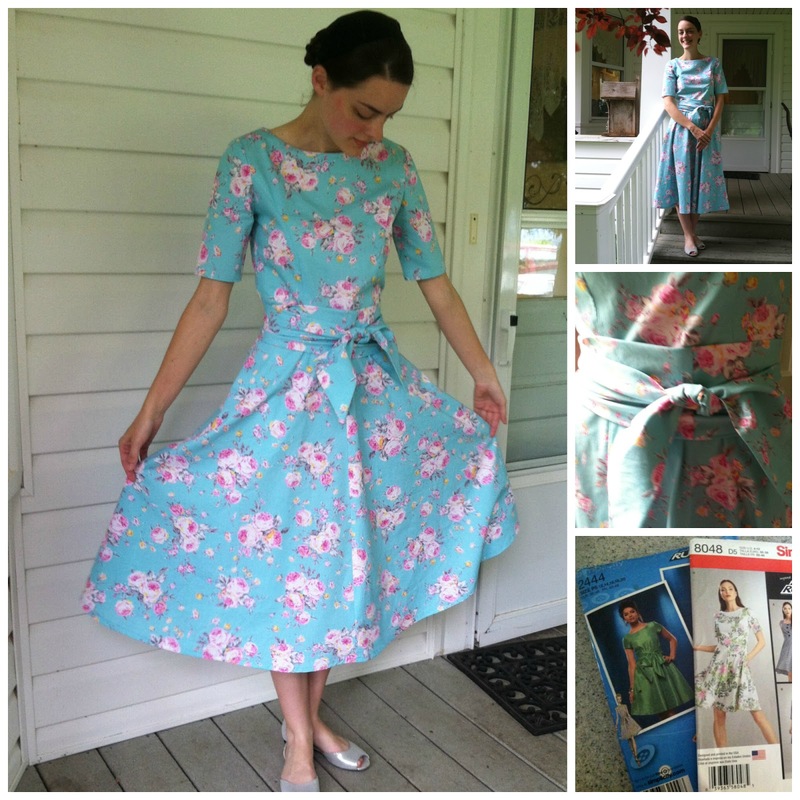 But I finished the dress! Steven: Hey, we're out of, like, old people cereal. Ben: Do you wash it down with prune juice? He had just returned from a Saturday outing to Horse Rock, directly east of our house at a high point in the foothills. Until he graduated from Oregon State University last year, Ben seldom had time to relax. 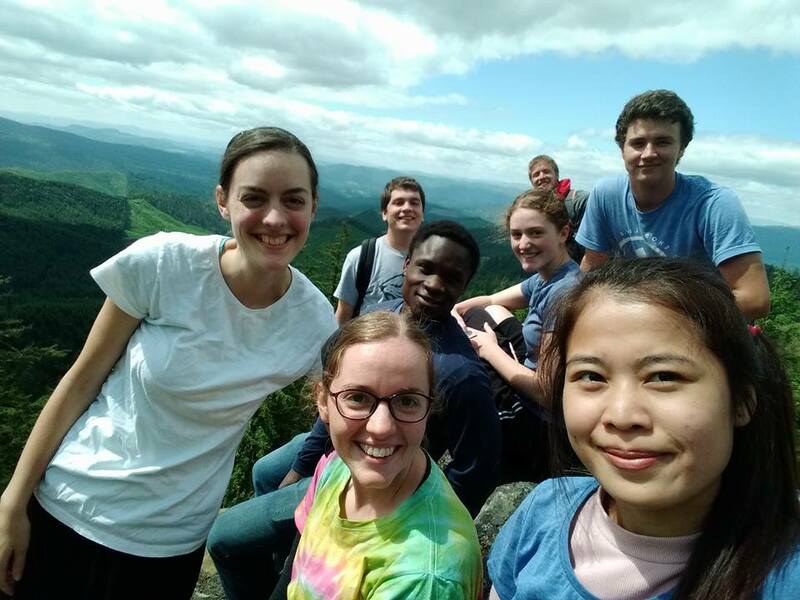 But this past year, as a graduate student researching combustion, he had more time and finances to indulge his love of hiking, camping, backpacking, canoeing, and all things of nature and the outdoors. Often, he gathered a few siblings and friends for a quick hike to Horse Rock. “Someday I want to go with you,” I would say. In the moment, though, I was always too busy, too committed elsewhere, and most of all too out of shape. “Is it a tough hike?” I asked. When you’re a perfectionist, you wait to try something until you’re sure you’ll do it well. In reality, if you make life a choice between perfection or nothing, you’ll mostly end up with nothing. We are only human, after all, living in a flawed world. Putting off the attempt because we won’t do it well often means we’ll never do it at all. “Growth mindset,” my kids remind me. It’s not about innate talent, like my sister-in-law Bonnie’s knack for baking, particularly beautiful, creamy, consistent cheesecakes that are the best I’ve ever seen or tasted. It’s about overcoming, learning, growing, letting go and having fun. My cheesecakes seldom turn out well, so I stick with cakes and pies. Limes were three for a dollar a few weeks ago at Grocery Deals, my friend Heidi’s discount store in Harrisburg. Suddenly hungry for a key lime dessert, I bought nine limes, went home, found a recipe, and recklessly made a lime cheesecake. It wasn’t as perfect as Bonnie’s cheesecakes, but that was OK. It was still smooth, rich, just tart enough, and best of all, uncracked across the top. So I went a little crazy and made two more. It was fun. If you move beyond a perfection-or-nothing mindset, you end up with something. Even a flawed something is far better than nothing at all. I walked on a treadmill several times a week all through the wet spring. When the weather improved, I walked to the railroad tracks and back every day. But I still didn’t feel ready for a hike in the mountains with my athletic young-adult kids. It was the promise of wildflowers that pushed me to say yes. They would soon be gone, and I, still waiting for perfect fitness and readiness, would miss them entirely. That Sunday morning, I packed a large Crock Pot of baked chicken plus three Tupperware containers of cupcakes for the Sunday school picnic. Then, expectantly, I packed in hiking clothes as well. Ben said he’d take his hiking poles, just for me. After the morning service and lunch in the Brownsville Pioneer Park, five of our kids, three of their friends and I got into two cars and headed east to the road that threads southward on the backside of the hills we see from our house. “Then you make a 135-degree turn off the gravel road and onto the driveway,” Ben the engineer directed me. All the "kids"--Emily, Amy, and Joy-from-Thailand in front. Ben,Steven, Jenny, Travis Miller, and Javen Bear in back. We parked, got out and started off, past a wire barrier to motorized vehicles and up a path through a young forest. The path kept going up. And up. The long-legged young men in our group walked effortlessly, relaxed and loose-limbed. The much-shorter young ladies kept up with them, marching steadily. The trail continued upward. My legs ached, and soon I was sure everyone could hear my labored breathing in the quiet forest. “Are we almost there?” I puffed to my daughter Emily, who stayed with me. I apologized for coming along and holding up the group. “Growth mindset, Mom,” Emily reminded me, meaning that it was OK for me to go hiking even if I wasn’t good at it. He said it was and, after a bit more reassurance, the others took off, and I was alone with the firs, sword ferns and filtered sunlight, with time, wonder and gratitude. I could rest as often and wheeze as noisily as I pleased. Step by step, over small logs, around curves, slowly up and up. The others waited for me at the beginning of the high meadow, and we posed for pictures at the edge, where layers of mountains curved away behind us, into the south. The kids included me in the photos as though I belonged, and then they all took off for Horse Rock, which lay like a dark mane on the slope a mile away. The flowers were as lovely as Ben had said, bright purples and oranges against the sunny green. I wandered along the path, admiring and trying to catch their colors in photos. I made it to that big rock in the center, which is a lot farther than it looks. 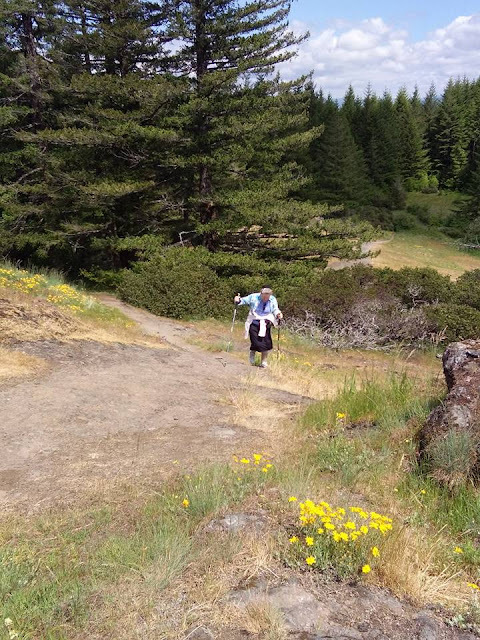 I didn’t make it to Horse Rock itself, but I made it to a large outcropping halfway there before I turned back and hiked down, down, down, over logs and around trees, through the refreshing shade, back to the car, where I rewarded myself with a leftover chocolate cupcake and rested until the others returned. I made it this far! “Besides growing legs a foot longer, how do I prepare myself to hike all the way to Horse Rock?” I asked our son Steven the next day. Whether it’s decorating a room, writing a novel, baking a cheesecake or going on a hike, if I wait to try it until I’m fully prepared, and make it a choice between perfection or nothing, I’ll most likely end up with nothing. “Something” is much better than nothing, and a lot more rewarding and fun. Against a wide and tranquil green, the mountain meadow flowers bloom all orange and purple for anyone who shows up, equally generous to those who arrive in half an hour and those who take half the afternoon, propelled by borrowed hiking poles and laborious breathing. 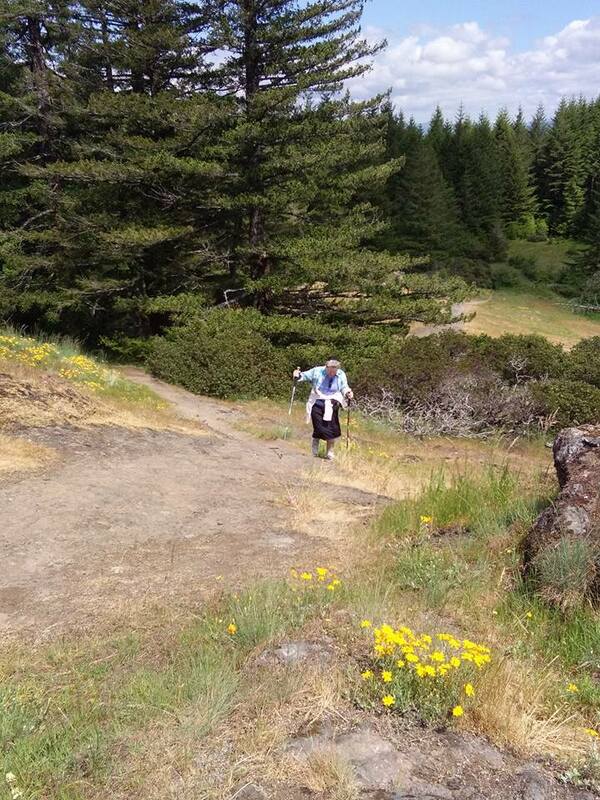 If that determined old lady can hike, anyone can. not about how you look getting there. 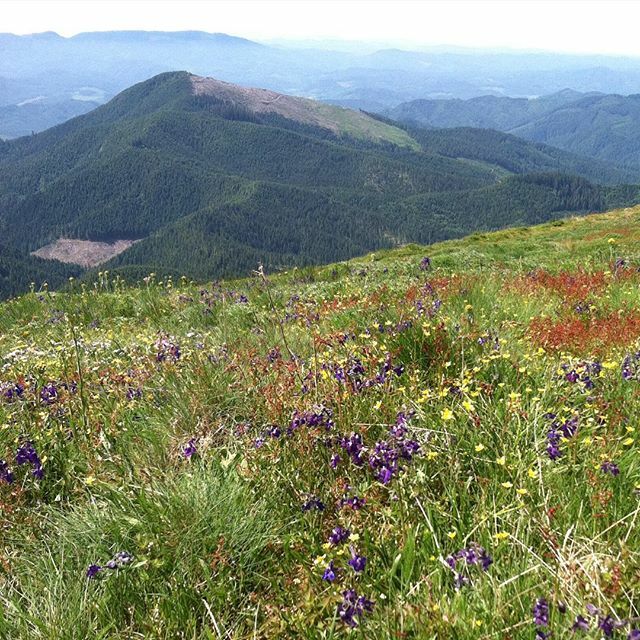 More wildflowers--on Mary's Peak, three days later. We have a nephew who is a log-truck driver who loves to play Boggle, and another who has something in common with a Canadian female figure skater. Kelly is married to Lisa, Paul's niece. They live in Michigan's Upper Peninsula, and on our recent trip to the area for a wedding, 20 relatives stayed in the house Lisa and Kelly were about to move into, and one evening we played games. "You and Kelly should play Boggle," Lisa told me. "He loves to play, and I just play to make him happy, but he needs some competition." I'm in a strange phase when it comes to Boggle, my far-and-away favorite game. I used to be the champ of pretty much every game I played [unless I played with Paul's brother John] and winning easily was always nice but it got a bit old. But now there's a pack of young dogs yapping at my heels, and, much as I try to tell myself it doesn't matter, it still ties me in knots when we play. "This will be fun," said Kelly gleefully. "I pretty much always win." Kelly is the only person I know who can brag in a lovable way. "You'd better be careful," Paul told him. "The last guy that said he always wins played Dorcas and lost by a long way." "Not me," Kelly said. "I'm gonna mop up the floor with her." The more this pending showdown was hyped up, fueled by comments and anticipation, the nervouser I got, way more anxious than the situation warranted. It doesn't matter, I kept telling myself, but still that determination to be The Winner and The Best grew and grew inside. We found paper and pens and took our seats. "I need my fast pen!" Kelly said. "I can't write fast without my special pen!" I took one horrified look at the blue box containing the letter cubes. "FIVE?? You play with a five-square and not a four-square??" "Yeah," Kelly said. "I find some really long words." "So the words have to be at least four letters?" I squeaked, defeat before me already, because long strings of 3-letter words are my gift, my foundation, the basis for most of my points. "Yep. 4-letter words are one point, 5-letter are two." My balloon of anticipation slowly deflated. I had lost before I even began, I knew it. The 5-by-5 game board totally threw off my strategy, but I played my best anyhow. Lisa played bravely even though she found a lot fewer words than the rest of us. Kelly and I kept an eye on each other's lists and hid our scores under folded corners of our papers. Paul's nephew Conrad had quietly joined the game. He found some surprisingly long words, but he didn't make a big ado about this, or join in the competitive spirit, or hide his scores. The competition was taut as we filled columns and pages with words. We all borrowed Anne's Scrabble dictionary to verify words. Kelly and I still bantered. Lisa quit after a while. Conrad just smiled and played like it didn't matter. I wrote madly, sensing that the wolves were nipping at my heels. Finally we decided to quit after one more game. Kelly refused to share his total, but obviously Goliath had fallen. Could it be? I put my head on my arms and slowly exhaled. I could still outrun the youngsters. We stayed at the table, laughing and talking. A few minutes later, Conrad spoke up. "Aunt Dorcas, how many points did you get the first round?" I found my paper. "Ummm, 28!" He looked amused. "Did you forget that I didn't join the game until the second round?" I'm pretty sure I screamed. I had completely forgotten. So Conrad, totally apart and above Kelly's and my frenzied little competition, had actually won the game, unobtrusively and by a long way. I told him he reminds me of Elizabeth Manley. We were living in Canada in 1988 when the Winter Olympics were held in Calgary. I still remember the hyped-up rivalry between Debi Thomas and Katarina Witt that was played up in the media for weeks prior to the competition. Debi Thomas, and American, was unusual for being a black skater at that level. She was intense and determined, and you didn't see her smiling. Katarina Witt was East German and known for being flamboyant and for her "daring" skating outfits. She was sure of herself and mocking of lesser mortals. I'm guessing most Canadians remember what Elizabeth Manley, the Canadian skater, accomplished with no noise or publicity. Entering the 1988 Winter Olympics, few skating pundits and media analysts considered Manley to be a contender for an Olympic medal, and she received no offers of sponsorships. Battling illness, she nevertheless did well in compulsory figures and the short program. Heading into the long program, she was in third place behind the East German skater Katarina Witt and the American skater Debi Thomas. Witt and Thomas were both favourites for the gold medal, and the media had dubbed their rivalry as the "Battle of the Carmens", as both women chose to skate to music from the opera Carmen. Witt skated her long program cleanly but conservatively, and Thomas fell apart in her long program. Elizabeth Manley, however, gave the performance of her life, winning the long program and coming within a fraction of a point of beating Witt for the Olympic title. Her come-from-behind victory made her a national celebrity in Canada. Excellence speaks for itself, and sometimes the quietest people communicate the most effectively. After Paul's nephew's wedding in Michigan's Upper Peninsula, we left with Paul's mom and had a bit of extra time to road-trip back to the Minneapolis-St. Paul airport. We stopped at a cafe in the UP near Lake Superior. They had the good kind of jam. chimed in with advice. I love small-town cafes. Back when we were engaged, we hauled my belongings from Minnesota to Oregon. That is a long journey, and we learned lots of things about each other that we hadn't known before. I learned that Paul likes to set his eyes on the goal and push through until he gets there. The destination is everything. The journey is nothing. Also he has a max-capacity bladder. I liked to meander, stop, rest, look at stuff, and absorb the flavor of the places we passed. In the middle of Montana I would say, "Oh wouldn't it be fun to chase down that little gravel road between those wheat fields?" He thought I was merely making an observation. That trip was almost the end of us, but that is a story for another day, maybe 20 years from now when I have more courage, so don't ask. I have learned to respect deadlines and the fact that sometimes you really do have to keep driving. He likes to indulge my wishes whenever he can. "Was there anything you wanted to stop and see?" he said. "Yes! I'd love to go to Duluth and see the ships and the bridge that goes up!" He said, "We have plenty of time." So we went to Duluth, where goods such as grain and taconite go out in massive quantities, and coal and cement come in. We drove over the drawbridge, then we came back, parked, and walked along the Lakewalk. To my huge delight, the alarm sounded, the bridge went up, and a long vessel came through. We also walked through the nearby Corps of Engineers Museum and learned about the history of shipping on the Great Lakes. I like ships, history, and having a husband who encourages my interests. The tugboat at the right is pushing the Great Lakes Trader out the channel to Lake Superior. pushing the larger one to where she wants him to go. So far, Paul and I have tried to attend all our nieces' and nephews' weddings. The most recent nephew-groom was Caleb, Paul's brother Phil's son who worked for us one summer. Phil's family lives in Wisconsin, but Caleb had spent the last couple of years living in the Upper Peninsula of Michigan and working in the ubiquitous logging industry. That was where he met and courted Sharla, so that's where the wedding was held. Four of our family attended, plus Paul's mom, plus a few cousins, all of whom went and returned by various convoluted means. You can read Emily's description of this on her blog. I was especially eager to go because that community in Michigan is also home to Paul's niece Lisa. 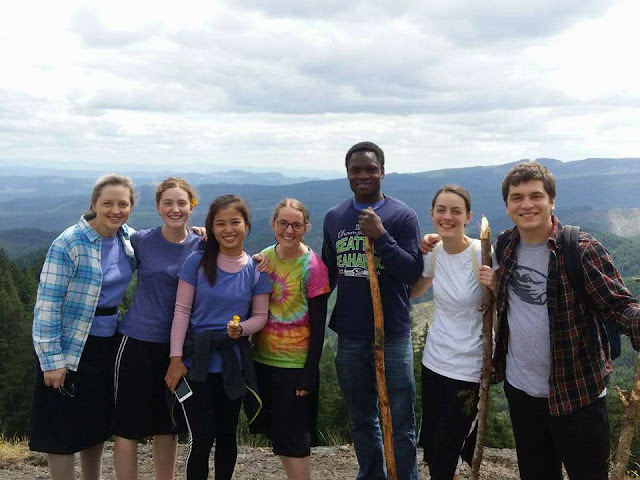 In good Menno-connection fashion, she went to Bible school in Washington and met a guy named Kelly from that little isolated church in Michigan. I was kept happily up to date on the courtship as Lisa worked for me every week, and I just might have been a meddling aunt now and then, asking questions and dispensing advice. I still remember the time Lisa wanted to show me her Christmas gift for Kelly and pulled a t-shirt the size of a baby quilt out of her bag. Yes, he really is that big, she said. And added, "I always thought I'd buy clothes for my boyfriend at some store like Urban Outfitters, but now I'm actually buying them at Coastal Farms." So I was also eager to see Lisa's turf, now that she has been married for some time and is expecting her second child. Lisa is a relaxed mom. Her little Isaac plays with screwdrivers. I had to brush up on my geography before we went. Did you know Michigan's Upper Peninsula actually sits on the northeastern edge of Wisconsin? Somehow I always thought it was all on the north side of one of the Great Lakes, and way up north by Canada. 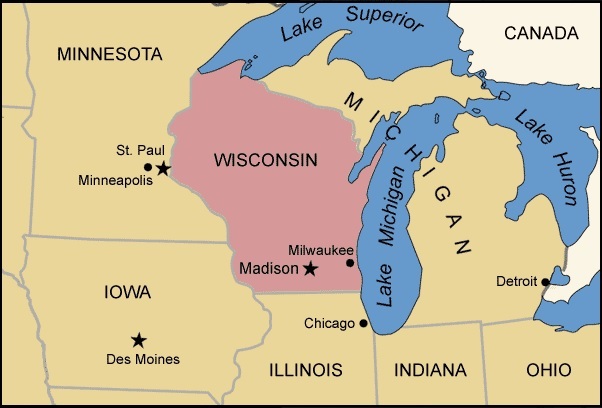 Part of the peninsula sits to the north of Lake Michigan, true, but the rest of it is firmly attached to Wisconsin, which means that it isn't that many hours' drive from my dad's place in Minnesota. All the years I lived in that part of the continent and I never figured that out. Our destination was east of Duluth, Minnesota, and south of Thunder Bay, Ontario, across Lake Superior. So Paul and I flew in, visited Dad, drove to the Minneapolis airport, picked up Emily and Paul's mom, Anne, and had a happy little road trip to Pelkie, Michigan. Dad doesn't miss a thing. The columbines were blooming in Minnesota. Emily and Anne sat in the back seat, ate ice cream, and discussed subjects such as dating. It was entertaining. Details here. Almost all the Smuckers stayed in the house that Kelly and Lisa were about to move into. It was loud and fun. Caleb and Sharla got married. It was a different stripe of Mennonite people than I am used to, so even within the culture you can have a cultural experience, and laugh out loud in the service when no one else does. Lisa and her family are doing well. The adorable little house that Caleb fixed up. Paul's mom Anne, Phil's wife Anna, and Caleb's wife's sister. cross their arms like this. The scenery was very Northern and reminded me of Northwestern Ontario where we used to live. Then by one way or another we went home. And two days later, Amy came with her friend Joy, but that is a story for another day. I guess I didn't tell you about the epic Boggle game either, the one with parallels to women's figure skating at the Winter Olympics in Calgary. Or about the husband who indulged his wife's love of big ships. Another day and time for those as well. "What if he was 15 years younger than you, and spry and handsome?"